Drug addiction has a negative impact on the family and just about everyone else the addict knows and cares about. It frustrates employers, disappoints friends, upsets spouses, terrifies parents, and neglects children. Drug addicts and alcoholics often lie, manipulate and steal. These behaviors tend to place stress upon everyone around them, and the unfortunate men and women who live with them are often traumatized by the experience. There tends to be wide emotional swings, from one end of the emotional spectrum to another that may ultimately push an entire family out of harmony. What’s more, if the problem persists, the entire family may suffer from a type of cumulative trauma. The experience of loving a drug addict or alcoholic is filled with fatigue and stress. It’s an unusual experience, especially for parents. They’re truly heartbroken. They’re dealing with the loss of a child who is still physically alive. It’s like grief in limbo. The stress does not end, because there is no closure. The relationship between a parent and addicted adult child is fraught with loneliness. There is an aching sadness for the child the parent once knew. It’s similar to an adult child having a relationship with a parent suffering with dementia. Children depend on their parents for support and stability. Unfortunately, millions of children have parents who abuse drugs and alcohol. Households with parental addiction are typically far outside the range of normal childhood experiences. Frightening and unexpected events often interrupt normal family activities. 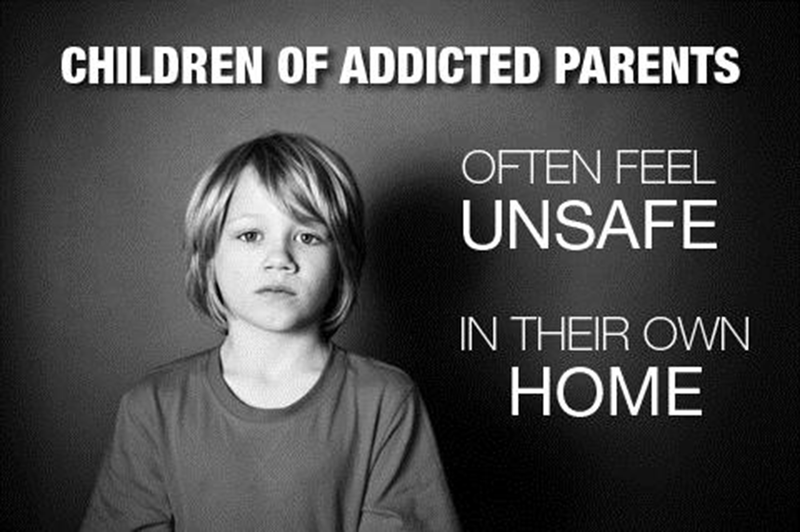 Consequently, children of addicted parents often feel unsafe in their own home. So they develop survival skills such as “don’t trust anyone” and “don’t feel anything.” Rather than risk feeling painful emotions, they choose to feel nothing. This is called emotional numbing and it has the potential to change the way affected children view the world for the rest of their lives. It can also create a negative and distorted sense of identity and self-worth. To make matters worse, they may demonstrate behavioral and temperament traits that predispose them to future instability. When children impacted by parental addiction, grow up and enter into intimate relationships, their feelings of dependence and vulnerability, which are normal parts of any intimate relationship, may make them feel anxious and at risk again. Beneath the level of their awareness, they worry that chaos, out-of-control behavior and abuse may be looming around the corner, because this is what they experienced during childhood. The ability to escape perceived or real danger is one of the factors that determine whether or not one develops PTSD. For children impacted by parental addiction, escape from the home is typically not possible. For this reason, adult children of parental addiction have psychological, emotional and behavioral issues that resemble PTSD. Not knowing what is normal. Fear and mistrust for authority figures. Difficulty enjoying life (cannot have fun). Never feeling a part of a group. Super responsible or super irresponsible.